This aluminum sliding gate matches perfectly with the style of the home. Notice that the owner had the aluminum track and carriage bodies painted white to match the rest of the gate design. Your imagination is the limit when it comes to designing a gate with this cantilever gate hardware. 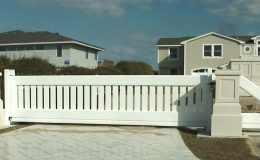 This particular gate uses our larger aluminum track model (CGA-350.8P) which can accommodate a gate opening width of approx. 26FT and a weight of 700LBS. Thank you Turlington Construction for sharing this project with us.